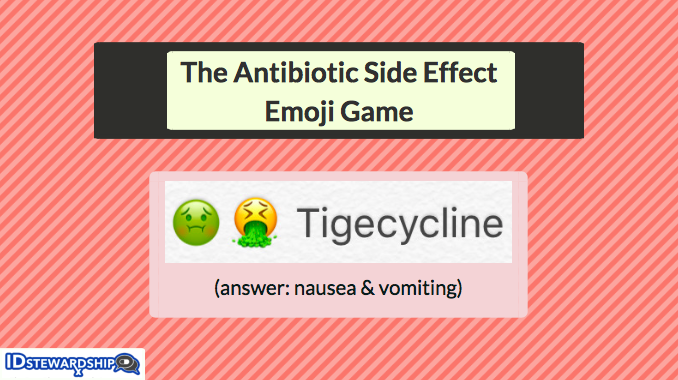 From the maker of The Drug Name Emoji Game comes… The Antibiotic Side Effect Emoji Game!!! Here is a fun game that has to do with antibiotic side effects. If you like emojis + puzzles + pharmacy, then this is a game for you! Emojis are pretty awesome, so why not try to use them for learning? That was the motivation for creating this simple game. Each of the 25 emoji/ drug combinations below represents a side effect that is associated with that drug, as represented by emojis. Try to figure out what side effects the emojis are hinting at. If you think this is a fun game, share it with your friends! I mean c’mon, who wouldn’t want to play a pharmacy trivia game involving emojis? Thank you to the creative people on social media who suggested a few of these! If you have an idea that is not shown above, share it and tag @IDstewardship on Twitter or Instagram! 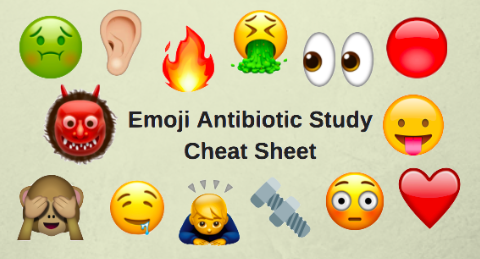 The first ever antibiotic study cheat sheet… using emojis! Click here to see cheat sheets. 1. Nausea & vomiting. This is a frequent side effect of tigecycline, so many clinicians will preemptively prescribe an antiemetic to be given as needed at the time of initing tigecycline therapy. 2. Myalgias, muscle weakness, rhabdomyolysis. Monitor CK levels when using daptomycin. Statin co-administration may increase the risk for this. Here is an article on that topic. 3. Diarrhea. Pretty much all antibiotics can cause diarrhea (including Clostridium difficile associated diarrhea), but clindamycin is one of the most common to cause it. 4. Fatigue/ anemia. Ribavirin can cause hemoglobin to drop which leads to anemia and fatigue. It can be severe, so patients receiving ribavirin should be monitored accordingly and dose adjustments may be necessary during therapy. 5. Fever and chills (infusion-mediated reactions). Infusion-mediated reactions associated with amphotericin B have earned the drug the nickname “ampho-terrible” because it can make patients feel terrible. Infusion-mediated reactions can include fever, chills, rigors, hypotension, flushing, tachypnea, and other. Clinicians commonly consider premedications prior to infusion with drugs such as diphenhydramine, acetaminophen, meperidine (for rigors specifically), and/or hydrocortisone. 6. Hyperbilirubinemia. I usually use generic drug names, but most people know this one by the brand name Synercid. The generic name is quinupristin/dalfopristin. Fortunately today we have better drugs and Synercid is rarely used. Synercid is associated with hyperbilirubinemia, thrombophlebitis, rhabdomyolysis, and several other concerning side effects. 7. Foamy urine. This is somewhat benign, but it is interesting nonetheless. According to the package insert, telavancin is associated with foamy urine. If I were a patient it is something I would probably appreciate being warned about. 8. Teratogenicity. Ganciclovir has a FDA boxed warning for suppressing fertility in females, inhibiting spermatogenesis in males, and causing birth defects in pregnant women. It is a drug that requires special handling. 9. Mental health side effects. Fluoroquinolone (ciprofloxacin, levofloxacin, moxifloxacin, delafloxacin) have a lot of concerning toxicities. In July of 2018 the FDA specifically put out a warning about mental health side effects (e.g., disturbances in attention, disorientation, agitation, memory impairment). This was combined with an alert about hypoglycemia. In addition to these, fluoroquinolones can cause phototoxicity and QTc prolongation. On top of it all they carry FDA boxed warnings for tendonitis, tendon rupture, peripheral neuropathy, CNS effects, and worsening of myasthenia gravis. 10. Crystaluria. Acyclovir is associated with renal toxicity, including crystaluria. Particularly when using high-dose IV acyclovir be on the lookout to provide hydration with NS and monitor renal function. 11. Red Man Syndrome. This is NOT an allergy. When infused too quickly IV vancomycin can cause histamine release, which causes flushing and the persons face and neck can turn red. This is referred to as “red man syndrome” or “red person syndrome” or “red neck syndrome.” Stoping the vancomycin infusion, giving an antihistamine, waiting for the reaction to subside, then resuming at a slower infusion rate will typically resolve the issue. Each gram of vancomycin should be infused over at least 60 minutes. 12. Metallic taste. Metronidazole can cause a really nasty metallic taste to occur. I have not heard of any great ways for managing this, but word on the street is cinnamon gum or miracle fruit may be helpful. 13. Orange secretions. It may be more of a consequence than a side effect, but nevertheless rifampin can cause urine, sweat, tears, and other secretions to turn an orange/ red color. It is good to warn patients of this so they do not jump to the conclusion they are having a bleeding issue when they notice their urine has an orange/red tinge. 14. Thrombocytopenia. Linezolid (and tidezolid) both can cause thrombocytopenia, which means low platelets. This is something to monitor at baseline and usually at least weekly on therapy. It is something that can cause therapy to be ceased, so clinicians need to be on the lookout for linezolid-induced thrombocytopenia. On the topic of linezolid toxicities, long-term use (>28 days) is associated with peripheral neuropathy and optic neuritis, both of which can be irreversible. Yikes! 15. QTc prolongation. All the macrolides can cause QTc prolongation, including azithromycin. Two other drug classes associated with this side effect are Azole antifungals and fluoroquinolones. 16. Hearing loss / ototoxicity. Aminoglycosides are associated with ototoxicity and nephrotoxicity. Therapeutic drug monitoring can assist in mitigating the risk of these toxicities. 17. Optic neuritis. Ethambutol is associated with this toxicity of the eye. Ethambutol is most commonly used for treating Mycobacterium tuberculosis infections. 18. Sun burn / phototoxicity. Several drugs are associated with this side effect, including SMX/TMP (Bactrim) and the tetracyclines. Patients should be warned to take necessary precautions so they can avoid needlessly experiencing this toxicity. 19. Methemoglobinemia. Dapsone has been associated with methemoglobinemia, which can be life threatening. One study found long-term use was associated with this toxicity in 15% of patients. 20. GI side effects. Erythromycin is a motilin agonist, which means it can cause GI side effects. Erythromycin is even used for diabetic gastroparesis sometimes for its ability to work as a motilin agonist. 21. Decreased urine output / nephrotoxicity. The polymyxins are associated with an alarming rate of nephrotoxicity. Use colistin (polymyxin E) and polymyxin B with caution. 22. Headache. While overall well tolerated, ledipasvir/sofosbuvir (Harvoni, used for chronic HCV infection) can have side effects of headache and fatigue. 23. Visual and auditory hallucinations. High levels of voriconazole (>5.5) have been associated with increased risk of toxicity. One of these is this central nervous system reaction. Voriconazole is also associated with visual disturbances. 24. Peripheral neuropathy. Isoniazid is a drug most commonly used for treating Mycobacterium tuberculosis infections. Many clinicians add pyridoxine (vitamin B-6) for patients on isoniazid, which may help reduce the risk of peripheral neuropathy. 25. Seizures. All beta-lactams have the potential to cause seizures, but imipenem-cilastatin is probably the #1 beta-lactam that comes to mind when it comes to risk for seizures. Make sure to adjust beta-lactam doses for renal function, as unnecessarily high drug exposure can increase the risks for toxicity.